I am new to hobie 16s and restoration of them. 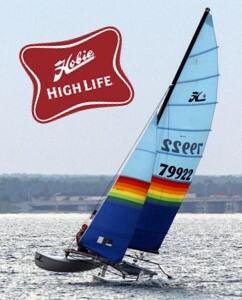 I bought an 83(or so I am told by the previous owner) hobie 16. I am working on getting the decals and pinstripes off and repainting or regel-coating it. The previous owner did some work to it to try to get what he thought was old pain off of it as parts of the boat are flaking. The hull has some green patches that are under the light blue "overcoat." Is the green color gel coat and the blue paint? It seems like a completely different layer for some reason. Any help would be appreciated greatly. The Model year should be easy to decipher from the hull number etched into the transoms just above the top rudder gudgeon (mount). Read about it on the Hobie Support Archive here. For removing decals or pin striping, I've used a flat razor blade (in a blade handle) and slowly/gently worked to scrape them off. Follow that up with 3M adhesive remover and you should be pretty good. Really stubborn adhesive residue will come off with acetone. Not sure what to make of your "flaking" comment and the different paint colors / layers. Maybe some pictures would help us. I did a complete gelcoat restoration on my '84... it was slow and laborious but it shines like a new boat now. Sanding with 800 grit, then 1200 grit, followed by an orbital buffer and Meguires #49 oxidation remover. Always start with the least aggressive product for your needs though. The only hull colors being made in 1983 were white, yellow and blue. A green boat is from the early '70s. I think the boat is older than you think.